I just had to post so that all of you would see the tweeks I made to the blog. It’s so much more colorful and inviting. I hope you like it as much as I do. Even though we are still 47 days away from Alex and Evan’s birthday, I have already started the planning. The invitations are done (handmade) and ready to be mailed. Some of the paper products and decorations have been bought and the menu is all planned. Some people think I am crazy for planning this far in advance, but people don’t understand that my free time to do these things is limited, so waiting until the last minute is not an option. The theme this year is Mickey Mouse – which is going to be super fun. I really enjoy planning parties and I am so excited that I have two little ones to plan for! I am excited to share that Alex has been rolling over more. It’s never been an issue of him not being able to do it – he can – he just chooses not to. But lately, he has been rolling to his side more and I have been encouraging him to roll completely. His biggest problem was getting his arm out from underneath him. He has now figured that out and gets really excited to roll over because he knows what a great reaction it gets. He doesn’t stay for too long, but it’s a big accomplishment for him. He is still working on his sitting, which he can do as well, but if he gets excited, he’ll throw himself back. Unfortunately, we still don’t have the gait trainer. What a process….that is taking FOREVER!! We did get a walker from a friend so he can scoot around the deck outside and play with some toys while standing – which is great. 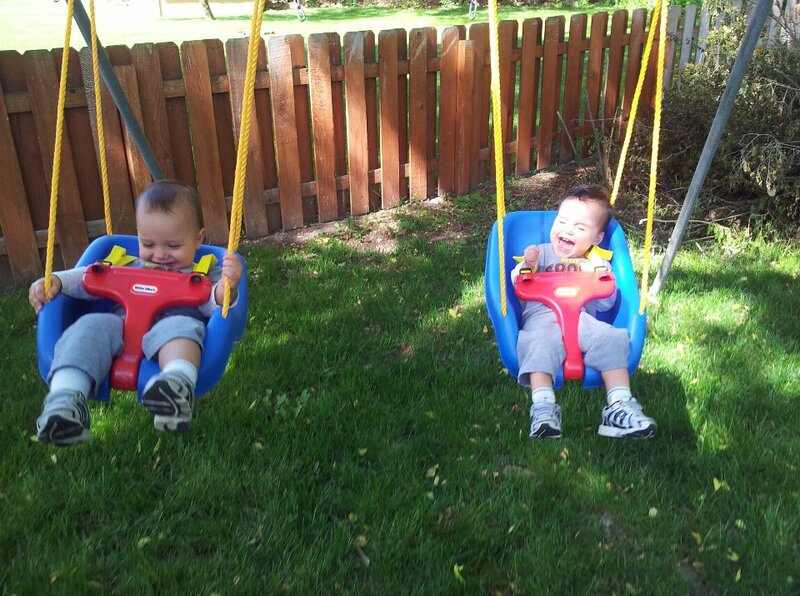 The boys have really enjoyed spending more time outside – especially on their swing set! My grandpa built it for me 30 years ago and my Dad brought it over and set it up for us. It has their toddler swings on it now but it’s ready for regular swings on down the road. I am so happy to pass it down to them because they will never get to meet my grandpa since he passed a few months before they were born. This past weekend, we were able to visit with Alex and Evan’s Great Aunts and Uncle. They LOVE seeing the boys and always get a show with Evan. This time he decided to chuck his spoon across the dinner table and in the process chunks of hot dog went flying in the air. I thought Aunt Rosalee and Aunt Carolyn were going to choke on their food they were laughing so hard! They got a picture last year holding the boys and wanted to get another one this year to see the difference. This was as good as we could get thanks to Evan. Evan really likes Uncle Claude and wanted to sit next to him for a bit at the table. We all had a really nice time despite the flying food and can’t wait to see them more this summer. I am just in love with my kids. Yes, they can drive me absolute mad sometimes, but then they smile or laugh or do something out of the ordinary that just makes all the stress and frustration not seem so bad. This post is going to be all about Evan. Evan is my little comedian. He LOVES to make people laugh (especially his brother) and he looks for reactions in people which is even cuter. He is so independent and plays so well by himself (he actually prefers it). He loves to explore and try new things. He is so adorable and can be a little teddy bear when he wants to be. He isn’t crazy about heights or spinning around and we can only swing him so high on the swing. He only likes it when the moon roof in the car is opened half way and he occasionally gets mad if I change the radio in the car when it’s a song he likes. In addition to all of the emotions I have and feel for Alex and his CP, I sometimes have guilt when it comes to Evan. There are times when I feel bad because I do spend more time with Alex (stretching, helping him sit, working on things, holding him and taking him to therapy) none of which is Alex’s fault. Although Evan is very independent, he still needs the same attention and love. Don’t get me wrong – I don’t ignore him, I just wish I wouldn’t feel so bad for not having as much one on one time with him like I do with Alex. I also discipline him more than Alex so I always feel like I am yelling at him. It obviously hasn’t sunk in yet that he is a boy – and he is all boy. He explores and is out to destroy. With all of that being said, I am so proud of Evan and all of his accomplishments. He is such a smart little boy and I truly enjoy watching him grow and discover new things. He has such an awesome personality and he loves Alex so much – and it shows! Evan’s newest thing is blowing on Alex’s belly! He did it for the first time last Friday and I just about peed my pants when I saw it. I was on the phone with Eric looking down into the family room when I witnessed it. It was so adorable! He’ll do it every now and then if we ask him to. He also just started gargling liquids. Mostly when he drinks out of his cup; I have no idea how he discovered it, but that too is funny. 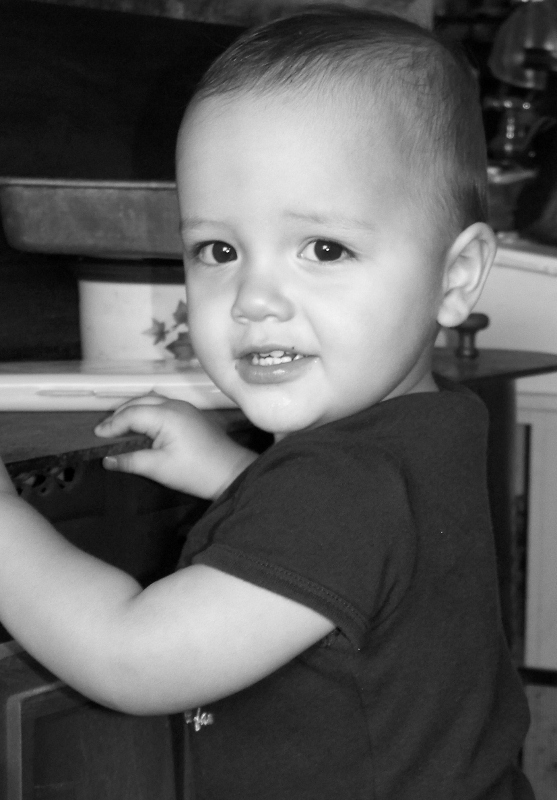 Evan can be very aggressive and he is full of energy, but there are moments where that boy will just melt my heart. Sometimes he will come over and give me a hug or kiss; sometimes he’ll come over and rub my head softly, or if I am on the floor with Alex he will back up and sit on my lap which is usually followed by him turning around and smiling at me. When it’s bedtime, he wants to cuddle with me (sorry Eric) and have me tuck him in. He is growing up fast and I just wanted to share a little bit about my boy Evan. He is amazing and wonderful and he is my son. I came across this video and wanted to share it with you. I will admit that my faith has been tested more than a few times in the past 22 months and many times I have wondered why I was picked to be a Mother of a special needs child. This gives me a clearer picture, a better understanding of it all. Enjoy. It’s been awhile since I have written, so let me follow up on a couple of things. Alex’s gait trainer is in process and I say in process because I am not sure exactly where we are at with it, but the paperwork is being done and hopefully we will have it for summer! It’s been such a circus trying to get people to do their jobs. But I think we are on our way. Alex was approved for six more months of Outpatient Physical Therapy with his insurance (YAY!) so we are set through October. I have been continuing to work with him on picking up small foods and self feeding. He is doing great picking them up and getting them TO his mouth, it's getting them IN his mouth that is a problem. No worries though because we just keep working on it. It’s already been a year since Alex started Therapy with Early On. (Early On is a state funded program available through our school district that provide services such as PT, OT and Speech Therapy to children with developmental delays) I had to meet with the ladies from the school the other day to do his goals and paperwork for next year. So much has happened in the last year it’s hard to remember all of it. Eric and I videotaped a conversation we had the other night about all of Alex’s accomplishments we have noticed in the year. I was a bit down after talking with his therapists because I always feel like other people make me feel like Alex isn’t as far as he should be. Well, when you compare him to a normal developing 2 year old, he’s not, but when you really look at all he has done this past year, he has come so far. I never make it sound like I am disappointed in him because I’m not, but it’s like they want to make sure I am aware that he is no where he needs to be. DUH! That boy is so strong and I am determined to make sure he gets everything he needs. There are so many success stories of children with CP out there. People being told their children may never walk or talk and they do. That is my hope for Alex. He may not do it until he is 3 or 4 or even 5 but dammit, I am determined to see my son walk and to hear him talk. Last night he couldn’t sleep so I cuddled with him for a bit and I told him how much I love him and how I am going to do everything I possibly can to help him and have him live a normal life. I told him I will never let anyone hurt him or his brother and how I wish with all my heart that I could change things for him but I can’t. I cry more than I should over this and it’s not always because I am sad, it’s because more than anything I want him to be ok. I know full on now what it’s like to be a parent, to worry about my children constantly and just hope that they will grow up alright in this crazy world. It can be the best and worst feeling in the world – sometimes all at the same time. I wish I could constantly protect them, but I can’t because that’s the only way they are going to learn is if they are out there becoming who they are meant to be. Today I was sitting with Alex in the backyard in the grass (something he wouldn’t tolerate at all a year ago) and Evan is across the yard telling Eric how to trim the bushes (LOL) and I can’t believe they are going to be two years old in two months. I watched him as he walked toward me and he seemed so grown up but then my eyes panned out and he was so small in the big yard. And then there’s Alex. My little man who couldn’t sit on his own long enough a year ago for me to snap a picture of him is now sitting in the grass on his own…if only for a short period, it’s still long enough for me to take a picture of him. These are the moments that I am tucking way back in my memory so that I will always have them to reflect on.